12 Things You Don’t Know About Google! 1. Do you know that the name “Google” is a typo? Initially the founders of the site thought that they were going for “Googol”. 2. Are you aware of the fact why Google page is so simple? Its because the founders really didn’t know about HTML and so they wanted a quick interface. 3. Co-founders of Google.com, Mr. Larry Page and Mr. Sergey Brin started Google as a research project when they were 24 and 23 years respectively. Isn’t is very encouraging? 4. Presently, Google receives about 200 million search queries daily from all around the Globe. 5. 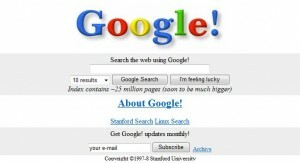 When Google was initially launched, there was no ‘Submit’ button. Instead, ‘Enter Key’ needed to be pressed. 6. Google Home page is set keeping in mind the other non-English countries. At present, you can set up it at 88 different languages. These include Latin, Urdu and Klingon language. 7. Do you know how long it will take for a person to search 3 billion pages of Google? Don worry, its will JUST take 5707 years!!! Thank god, there is Google software. It does it in 0.5 seconds….Really head scratching stuff. 8. What are Google’s logos, which appear in Google’s Homepage, called? It’s known as “Google Doodle”. 9. Most of us have heard about Google Earth but is there anyone who has heard about Google Moon and Google Mars? I think not really; the former site maps the lunar surface and the latter provides both the visible and infrared imagery view and shaded view. 10. Have you heard about the satellite imaging company, Keyhole,that Google acquired in October 2004? 11. 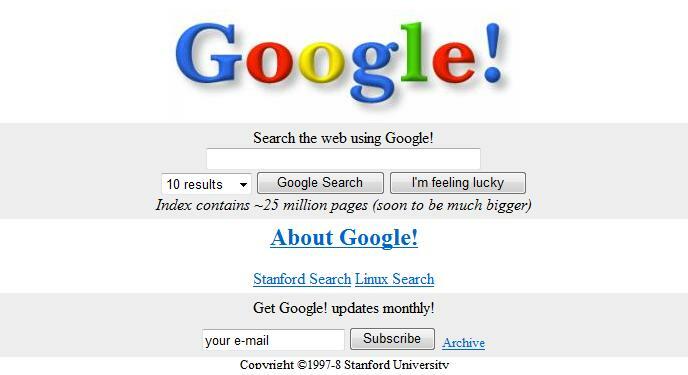 Google was launched in November 1998. Its index page mentioned the work on the prototype of Google.